One of the biggest misconceptions in Freemasonry is the process to become a Freemason. For many years I believed that I needed to be asked by a Freemason to become a Freemason. Furthermore, to ask to become a Freemason would blackball you for life. This misunderstanding led to me losing 20 years of fraternal ties because I was afraid to ask the Masons I knew if I could be a Mason. 1. You must ask a Master Mason for a petition to become a member of the fraternity. – A Master Mason should not solicit members to the fraternity however if he feels a man is worthy and deserving he can bring it up in conversation. Most importantly you must come on your own free will. A Master Mason cannot even ask loved ones, family members, or coworkers to join. There are some who are relaxing this guideline in recent years. However, you will never be recruited or pressured into petitioning. 1a. How to find a Mason: Masons are everywhere but unless you are a Mason you may not know what to look for. Some Masons are subtle about their membership while others present their membership broadly. Each is just as proud and humbled about their membership, and neither is better than the next. 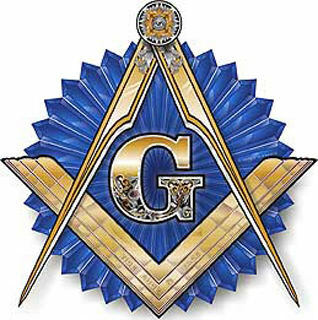 The best way to “spot a Mason” is to look for the Square and Compass pictured to the left. This is the “default symbol” of Freemasonry. Once you are a Mason you will learn and understand the importance and symbolism behind the symbol. Freemasons will wear this symbol as a ring, pin, ties, tattoo, stickers on their cars, Et Cetera. Do not be afraid to ask, if you are a good man a Mason will give you as much time as possible and at the minimum set you in the correct direction to start your journey. If you do not know anyone who is a Freemason, cannot find a lodge in your area or want to ensure you are going to the right place please check out the Grand Lodge of Free and Accepted Masons of the State of New York – lodge locator. 2. Fill out the Petition and return it to the Lodge you are petitioning. – The petition is then read at the stated meeting of the Lodge. The Master of the Lodge appoints a committee of Master Masons to investigate the petitioner. At this point, you will also be greeted with a mentor or coach. His job is to get to know you and to answer ALL of your questions. You will get invited to the Lodge for dinners, events, or just an evening of fellowship. During this time you will get to know the members of the Lodge and they will get to know you. It is a time to see if you are compatible with the Lodge, if you are a good fit or if you might be a better fit for another Lodge. You may even meet for lunch, coffee, or a couple of drinks. 3. The investigation committee sounds invasive, however, this is not the case. It is simply a check to see if you are a good man. They will often contact your wife and family to ensure that becoming a Mason is acceptable to them and it will not disrupt your home/family life. Most likely an interview will be given between you and the investigating committee. This interview is a very comfortable experience and it gives you the change to see and talk with some of the brothers in the lodge you petitioned. 4. The investigation committee will report its findings to the Master of the Lodge. The petition and investigation committee report will be read at the stated meeting and a secret ballot will be taken on the petitioner by members present for admission into the fraternity. 5. If elected to receive the degrees, a date will be set for the first Freemason Degree of Entered Apprentice. There are three Degrees in Freemasonry; Entered Apprentice, Fellowcraft, and Master Mason. Once you become a Master Mason you are at the “highest level” a Mason can obtain. There are other paths you can then take but I will save that for a different time. Freemasonry is a lifelong journey of learning starting with one simple step. 2B1ASK1.